What Should I Do If I Suspect a CO Problem? Carbon monoxide or CO is a toxic gas that is produced when fuels such as gasoline, oil, propane, kerosene, coal, wood and natural gas do not have an adequate supply of oxygen to burn completely. When CO is breathed into the body, it combines with the body's blood and prevents it from absorbing oxygen. High levels of carbon monoxide can be fatal. Symptoms are often mistaken for the flu -- severe headaches, nausea, vomiting and sleepiness. One difference is that with CO poisoning there is usually no fever, and symptoms tend to clear up when you go outside and breathe fresh air. CO poisoning also affects pets. What can I do to prevent CO in my home? The first line of defense against CO poisoning is to have your heating, hot water and venting systems inspected annually by a qualified technician. Between inspections check your equipment for signs of problems, such as soot or water collecting near a burner or vent. Equipment that uses natural gas should show a clear blue flame. A yellow or orange flame may indicate a problem. Installing a CO detector will give you added protection, but should not replace regular maintenance on appliances, heaters and venting systems. Follow the manufacturer's instructions for installation and make sure the detector meets the current IAS 6-96 safety standard. The U.S. Consumer Product Safety Commission recommends a CO detector on every floor in the hallway near sleeping areas. If you suspect a problem with an appliance, have a qualified service technician check it. If you think you are experiencing symptoms of CO poisoning, call the New Jersey Poison Control Center at 800-222-1222. If an emergency exists, get fresh air immediately and call 911. If you need additional information about CO, contact the Poison Control Center. If your organization is interested in learning more about carbon monoxide, contact our Speakers' Bureau Program at 732-938-1035. A representative from New Jersey Natural Gas will give your group more detailed information about CO and show a videotape that examines where CO comes from, as well as the dangers and symptoms associated with it. Fact Number One: Carbon monoxide is a poisonous gas that you can't see, taste or smell. It is impossible for humans to sense carbon monoxide in the air -- that's why it's often called "the silent killer." Fact Number Two: Carbon monoxide comes from the incomplete burning of fossil fuels, like gasoline, wood, kerosene, oil, coal and natural gas. Fact Number Three: Carbon monoxide is normally present in the air in low amounts that can't hurt you. But it becomes dangerous when it builds up over a long period of time in an enclosed space, like a house, a car or a garage. Fact Number Four: Carbon monoxide can come from many sources, like a broken furnace or water heater, a blocked chimney, a charcoal grill used indoors or a car warming up in a garage. Fact Number Five: Carbon monoxide can make a person sick if he or she is exposed to it over an extended period. It can even cause death. 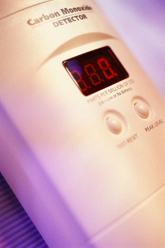 A person with carbon monoxide poisoning may complain of dizziness, headache, nausea and may feel very tired. Call the New Jersey Poison Control Hotline at 800-222-1222. If there's a medical emergency, such as someone falling unconscious, get the person outside to fresh air and call 911. Additionally, call NJNG at 800-221-0051. Further information can be found at New Jersey Poison Information and Education System.